Scottish zoologist IVAN TERRANCE SANDERSON (1911-1973) coined the word cryptozoology and first used it in print in this hard-to-find 1961 work, the story of "hairy hominids" across the planet from the very beginnings of human civilization until the mid 20th century. With its scientific, anthropological approach, this is one of the first books to treat the phenomenon of "Bigfoot" seriously, and introduced a groundbreaking classification system for the spectrum of subhumanoids. "I am happy that a whole new generation of cryptozoologists-in-training will be able to read Ivan T. Sanderson's classic book," says cryptozoologist Loren Coleman in his new introduction. "This book opened the minds of many to the vastness of the hominoid reports. and spotlighted for people that Bigfoot/Sasquatch research was the next area for exploration in North America." This new edition, complete with the original illustrations and maps, is part of Cosimo's Loren Coleman Presents series. 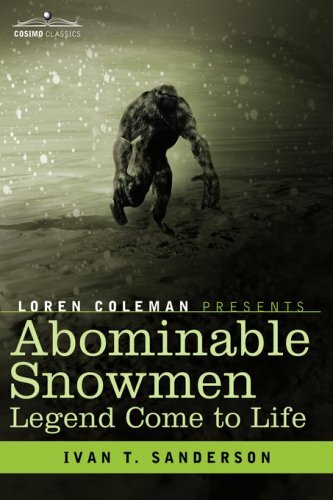 LOREN COLEMAN is author of numerous books of cryptozoology, including Bigfoot! : The True Story of Apes in America and Mothman and Other Curious Encounters.